Professional Catholic Steve Doocy, in a laughable segment laughably titled "Prescription for Justice," reported that the Catholic bishops are "up in arms" about the health care mandate. The chyron: "Losing the Religion, Catholic Church Challenges Health Care Law." 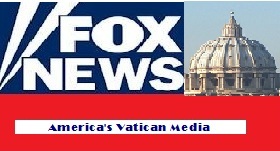 He showed a clip of Fox's alleged "news" reporter, White House correspondent Ed Henry, asking a question that was straight from the bishop's playbook: "How does the White House justify a law that basically forces people to violate their religious beliefs?" Doocy posed the question of whether this will cost Obama the Catholic vote. He introduced his fellow Catholic and Knight of Malta, Peter Johnson Jr. without noting that Johnson does legal work for the NY archdiocese. (No bias here, nosirreee). Johnson launched into a script that the bishops could have prepared. He said that while White House press secretary, Jay Carney, talks about balance, "there is no balance for religious liberty and 100% for pure political calculation to drive up the democratic base..." (And Fox isn't using this issue for politics? Really?) Doocy vociferously agreed. As the chyron read "Religious Freedom Fight, Catholics Rally Against Contraception Mandate," Johnson stated that this policy covers abortion drugs. For the first time in their biased coverage, Johnson did note that Catholics believe that emergency contraception kills the fetus. Doocy nodded his head and said "right" as Johnson, one more time, articulated the bishop's objections to the policy which "force" them to choose between an "illegal" law and "our obedience to God." Johnson, one more time, said he believed this is a "stark" violation of the constitution. The chyron provided the Fox message: "Election Year Showdown, Catholic Church vs. President Obama." For what appeared to be a first for Fox & Friends, Steve Doocy quoted liberal columnist EJ Dionne who objects to this policy. Doocy made the stunningly stupid comment that if you're a Catholic, you don't believe in contraceptives. The reality is that 98% of Catholic women use birth control. He yelled "for the administration to ram it down their throat...they're saying it's either my way or the highway." Fact Check - the rule provides them with an alternative to not provide health care but pay "assessments" to help women pay for their own policies. Johnson predicted that it will be hard for Obama to win the Catholic vote. After showing video of his other employer, Archbishop Dolan, speaking out against this policy, Johnson noted that GOP Senator Marco Rubio is sponsoring legislation to stop the mandate. He was almost blithering when he said that "now we'll see if religious liberty is a civil right" and "those on the left will protect civil disobedience and religious liberty in the same way they protect it for other causes that they find more palatable. Here's the thing, Pete. The left isn't going to protect "religious liberty" that discriminates against women. And speaking of women, if Fox & Friends were as "fair & balanced" as they say, why haven't they featured any women who will benefit from this policy? Why haven't they talked to representatives from women's' groups or attorneys who have dealt with cases involving contraception inequality? Oh wait, the bishops might not like that and if so, good Catholics Johnson and Doocy might lose their Plenary Indulgences or whatever quid pro quo that the bishops seems to have established with the "fair & balanced" Fox News professional Catholics. Where celibate male Storm Troopers tell women what’s what – or else!